So last weekend I was a bit sick but still made it out on Friday and Saturday for a little while. Unfortunately they were not hobbyists or coral collectors but they were scientists that worked for the museum which is pretty cool. Two of the guys were busy but one of them had a short chat with me. He explained that they come out sometimes to observe and collect reef fish. After our chat I went for a walk through the tide pools to see if I could find anything to add to my tank or find anything new for you guys to ID. 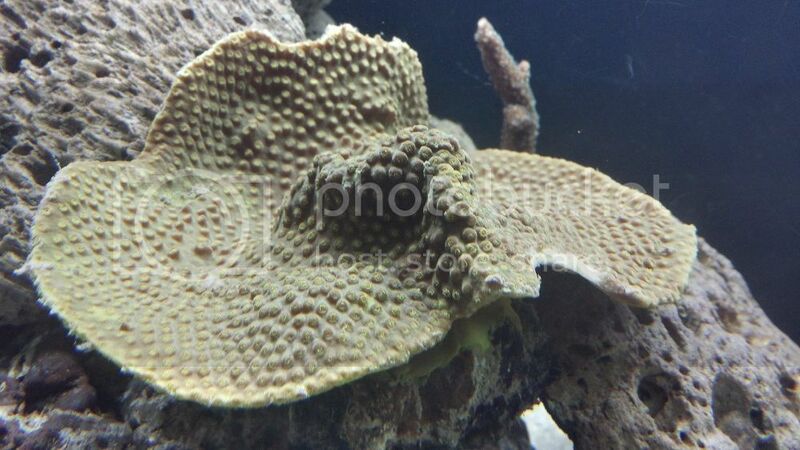 I think this is a plate coral, similar to the slipper corals? Anyone know what this is? There were quite a few rocks encrusted with diffent colours. 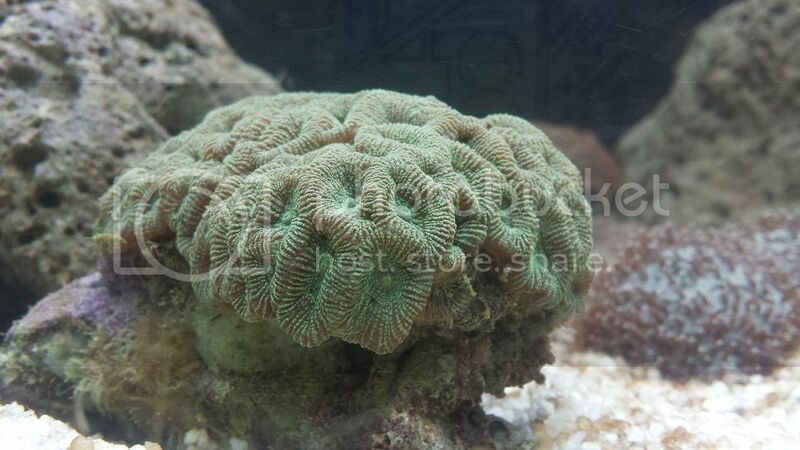 Last pic for Friday is a really nice green polyp acro. Here is one of the two frags of the green acro I took. This is the turbinaria I took. Its obviously had a rough time as it has a few chips missing from it. You can also see the other acro frag behind it. 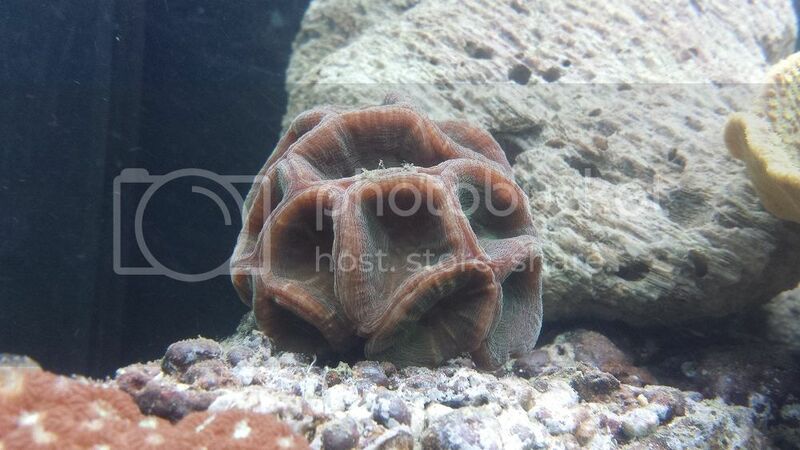 I also found a raelly nice small blue slipper coral that is now in my tank. Saturday I was determined to see what the other side of the bridge had. I also took a net with me this time as I have been seeing copper banded butterflys everywhere and would love to add one to my tank. I also had my first wake up call from being careless on Saturday (luckily it wasn't a croc, stone fish or blue ring). I climbed down the rocks on the side of the bridge as usual and I always jump off the last rock as it is usually a 0.5-1m drop so its easier than awkwardly climbing down with a bucket and other stuff. On the other side I just land in the mud (maybe 2cm deep) well on this side I jumped and went straight into the mud and just kept going until it was well and truly up past my knees and couldn't move (and I'm 6'2"). I turned around a threw my bucket and gear on top of the nearest rock and grabbed onto the ledge as i was still sinking quite fast. It took me about 5-10 minutes of wriggling and slowly pulling myself up onto the rock to get free. Certainly a good reminder to be careful out there. I stayed on the rocks and went around until there was solid ground where I could get down. I walked straight out into the river and washed off before having a look around and taking come pics. Its really very sad that I have found 2 almost whole engines just dumped off the same bridge. There is also a good dozen car batteries, and just a lot of other engine parts scattered around the coral. Today's engine appears to be from a V-twin motorcycle. The coolest thing I saw Saturday was the first wild starfish I have seen! There has probably been lots that I have blindly stumbled over though. Anyone know roughly what kind of star this could be? Saw another acro. This one was more brown in color and even looked a little bleached on the tips. There really is goniopora absolutely everywhere. Green, red, orange. Some have short polyps and some have really long polyps. I don't know if there is a difference between any of them but they look very cool swaying with the water. 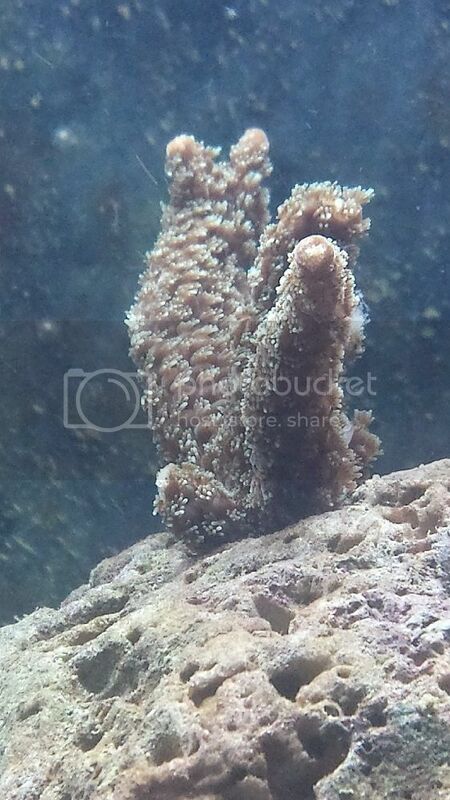 I also saw a slipper coral that was branching off? It looked as if one end was dying so it had grown another bit to replace it. Unfortunately I didn't see a single copper banded butterfly on this trip. But there were gobys everywhere and I managed to catch a small one. I don't have a photo of him yet as he has spent the first few days hiding in the rockwork of the tank. But he is coming out more so I will try and get a good photo in the next couple of days. Here is just a couple of pictures of the rock pools. Before I forget I also saw an eel! (I think) It was trying to hide so I only saw the last 10cm or so of the solid black tail as it went into some rocks. I'm not a big fan of eels and while they look cool whenever I am in the water I try to steer as clear of them as possible so I didn't go poking around to try and get a better look at it. 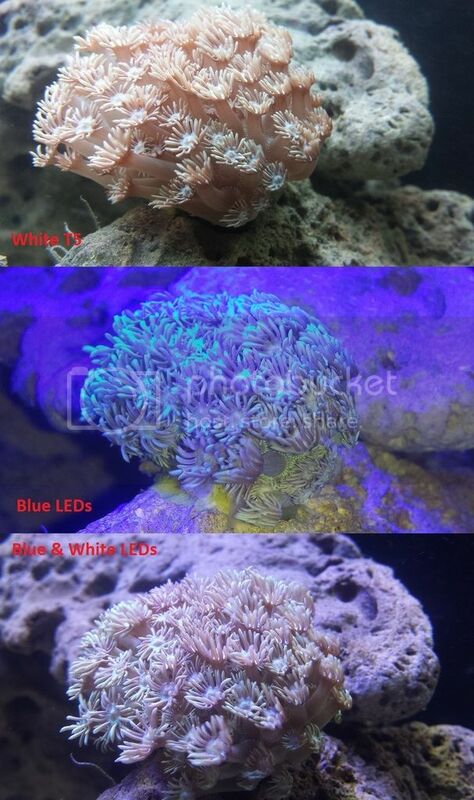 Any chance we can see these corals under actinic? Who knows you may have some fancy scores! 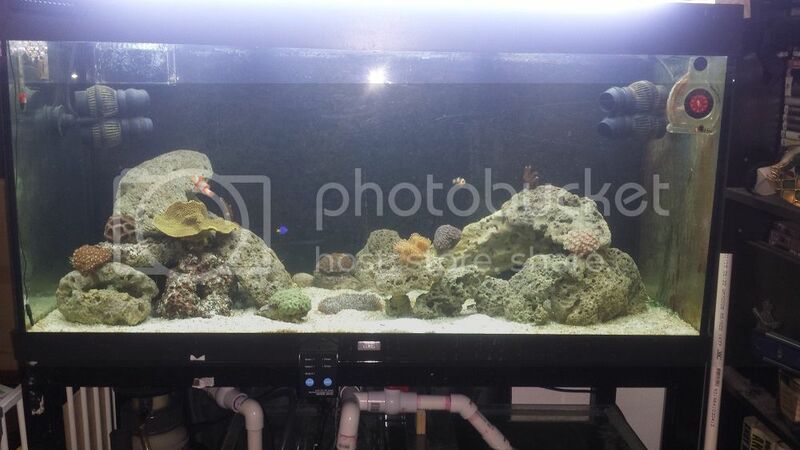 I bought some second hand BS-LED lights off a reefer on here so that I could get them under some blue light but when they arrived they don't work and now the seller isn't responding to any of my messages so seeing them under actinic will have to wait as I have a lot of other things I need to save up for first. And there is a few months ahead where all the low tides are at 1 and 2am so I may need a fix and go out at night so who knows. Just so I've got this right I throw the book at the crocs to scare them off yes? Hey macca, I'm in Darwin till next Tuesday. Would love to come out and have a poke around if you go again. Just need to convince the boss to put me on standby. Unfortunately there just isnt any good tides between now and then. To walk out where all the rock pools are the tide needs to be about 1.5m or less. (the 0.5m tides and lower are the best). Otherwise I would have been happy to go have a poke with you. MaccaPopEye wrote: Just so I've got this right I throw the book at the crocs to scare them off yes? thats exactly what I meant! I dont see what the big deal is with mud puppies anyway? The goby is now well and truly settled into the aquarium and eating pallet and frozen food fairly well, he has a lot of character. So far he is my favourite fish. Can anyone ID him? I almost forgot that when I caught the goby I also got one new coral that I haven’t seen much of out there. Anyone know what it is? I turned the lights on the other morning and it was fully opened up with long filter feeders sticking out of it (have only seen it like that the one time so far) by the time I got my phone out the filter feeders were mostly retracted. I will have to try and get a photo with the feeders all the way out as it was quite amazing. 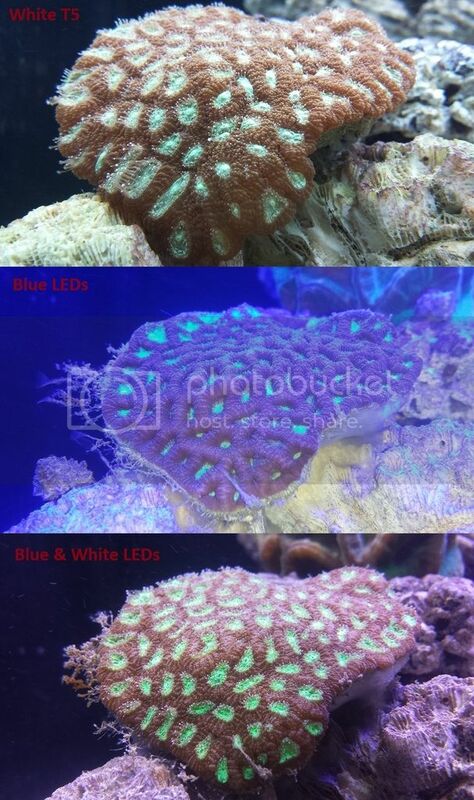 I have ordered new timers for the LED lights I bought so hopefully that fixes the problem and when they arrive maybe I can get some photos of all my corals under actinic lighting. Until then here is a few recent pics of them in my tank under the current white T5 lighting. Thought this one was dead and collected it with my LR. Turned out to still be alive and recover quite well. It’s very interesting as one side is the brown/red with highlights of green (the side pictured) and the other side is only brown/red and there is quite a distinctive split between the two (hard to get a photo of as it is at the back of the tank). 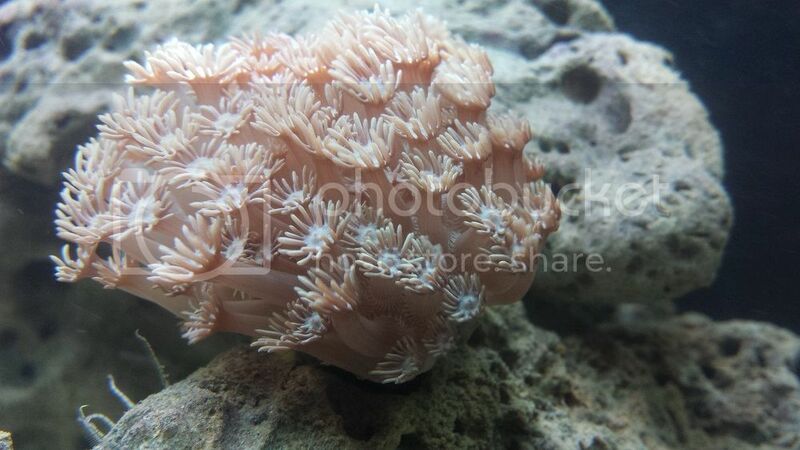 The maze coral seems to have gotten a white colour to it instead of the dark purple since being in my tank. I collected it from a rock pool where it was in direct sunlight so I am slowly moving it up higher on the rockwork to see if that helps. But its filter feeders come out every night. 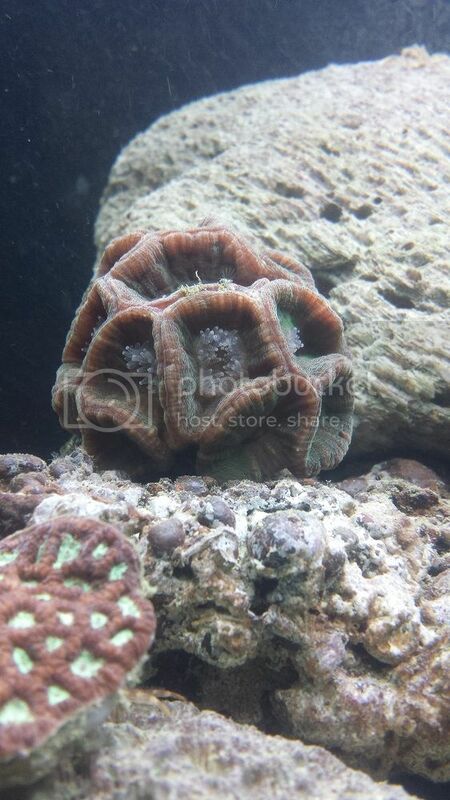 The turbinaria is doing well and extending its polyps every day (as are the two acro frags). It is having a bit of detritus settle on it though so I am looking into getting some stronger wave makers for my tank so I don’t have to turkey baster it off every couple of days. I have been thinking two of the Jebao RW-15 pumps would be good for my size tank. The green favia? is doing well. 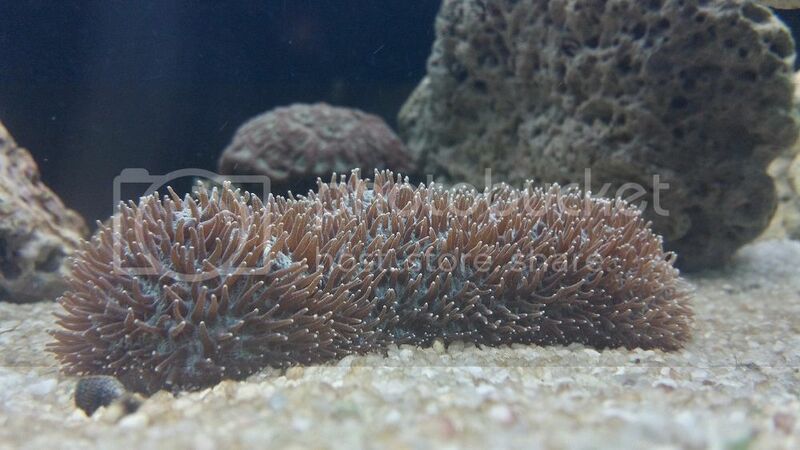 Can't wait to see it under actinic as this one looks like it will have some great colour to it. 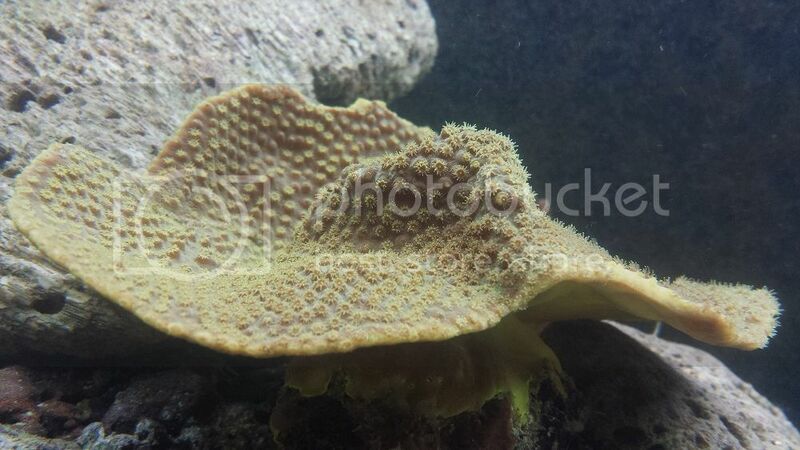 This one (maybe also a favia?) is interesting. It occasionally absorbs a lot of water and puffs right up and other times it extends some very cool filter feeders. The Goniopora is still doing well. I have still been feeding frozen food twice a week and I spot feed it then, on the other days I notice it will occasionally pull things out of the water column after I feed pellets (don’t know if it would be eating them though). And here is the tank as of its last water change last Thursday. Just over 2 months old. I am having some diatom issues and some other algae issues that I attribute partially to the end of a very quick cycle and slightly rushing things and adding livestock too quickly and then over feeding that livestock rather than just letting the cycled tank sit for a month to settle. But the skimmer is now plumbed in and hopefully with an aggressive water change schedule I can get that under control. There are some moderately low tides coming up so I may get out again in the next couple of weeks. 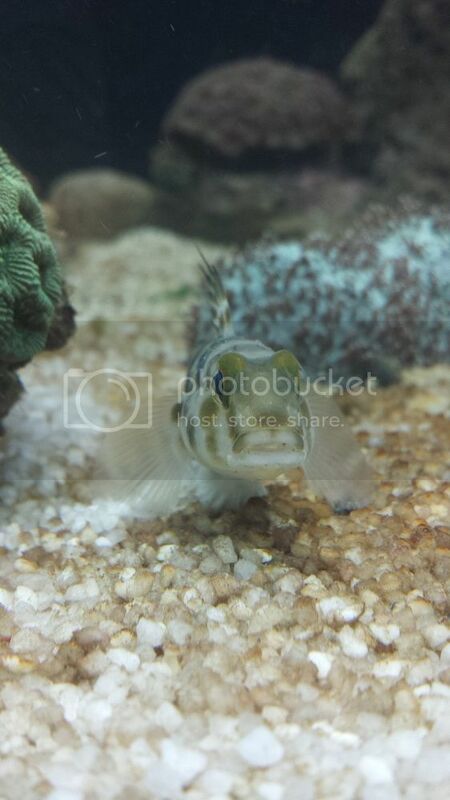 It looks like a sand goby, I have kept a similar southern one before (Gnatholepis scapulostigma). A google gave me a similar looking species, Acentrogobius caninus. As usual, your posts are gold Macca. Really great to see what conditions those corals are enduring in their natural habit. Would love to know parameter, for example, how hot are those pool with the Gonis getting too? You have to take some readings for us. Also, those pesky scientists are probably making notes about those unexplainable disappearing corals. Don't worry, they'll probably blame it on Global Warming. They'll probably comment: "It was notable that the more colour corals have disappeared from this area, whereas the bland coloured corals have maintained a dominant presence". In my local area they even stick little numbers on periwinkles. Which is something I may do with my turbos and Strombus. Turbo 1 and Turbo 2; Strombus 1. 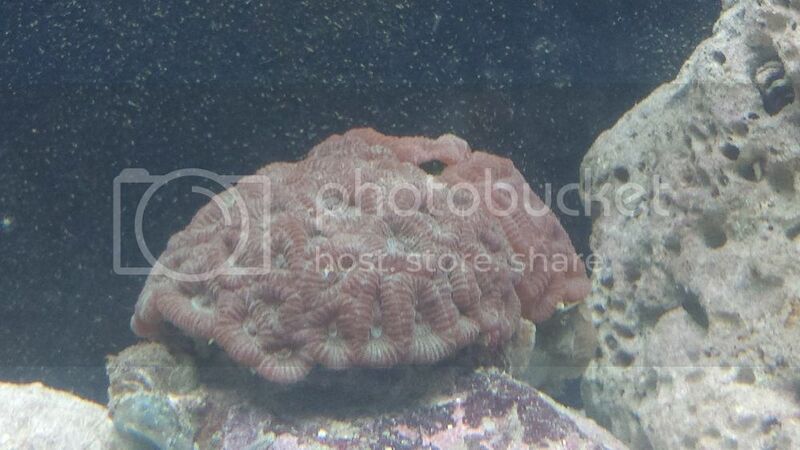 Small polyp blasto, goniastrea and a sand goby! You also asked to see the corals under actinic lighting and I have finally gotten the dodgy LEDs to work for the most part. I can’t get one white panel to light up and the timer functions don’t work so I need to have the lights plugged into the Chinese timer which is then plugged into a timer……… But I have put them over the tank and I have to say if all of the panels worked I would be very happy, wouldn’t even be too mad that the timer function doesn’t work. As it is the tank does look pretty good, just really mad about being screwed. 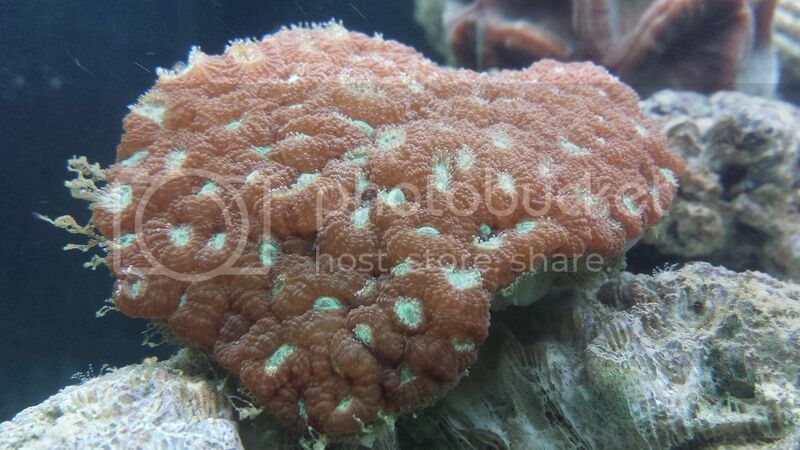 I am at work now but I will post some comparison photos of some of the corals I took today on my meal break. 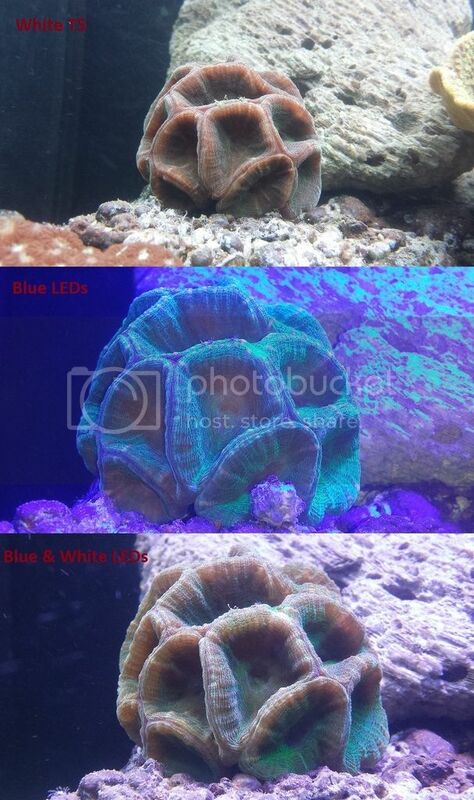 Unfortunately the green favia seems like it may be my first coral loss. It seems to have started RTN in the last 3-4 days . I don’t have any idea why yet, I will be doing some water tests tomorrow but last week cal, mag & alk were a little low but not too terrible (getting some sups this week), po4 0.2ppm and nitrate was only 10ppm. It’s a real shame because that one looks stunning under the blue lights. When I get levels stable I might try and collect another one. Good idea Savage Henry, I am going out again early next week so I will take a thermometer and get a water sample to test. The scientists seemed like nice blokes, they said that they run into hobbyist’s often. I think even if they run into hobbyist’s a lot there still isn’t enough in Darwin to create any danger to the coral population. The couple that I know of (have only actually met one in person) either don’t collect their own corals or don’t collect anymore due to the fact that there is now a supplier here who gets his corals from out at sea so they are much nicer. 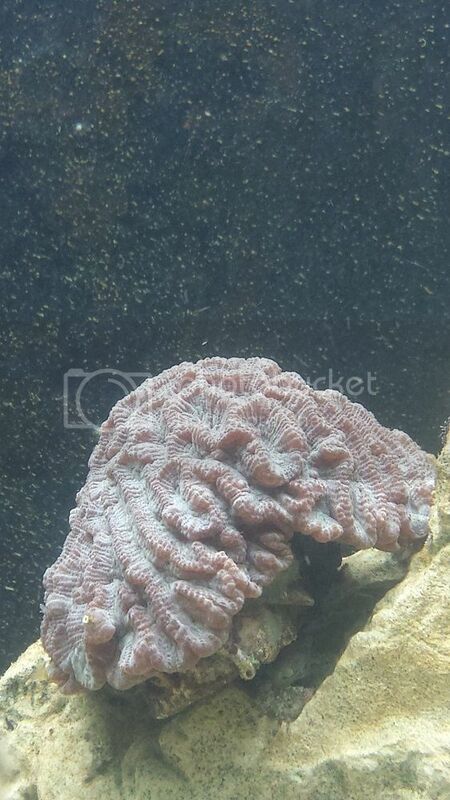 I can’t really afford to spend money on coral yet right now though and I like going out to the rock pools and looking anyway, so I will keep collecting for now if I see something that I like. Most of the corals I have collected were either upside down, hanging on by a thread or had been mostly buried with mud anyway. It has been a while since I popped in here. I'm on night shift now but I will post an update on my tank over the next couple of days. It's actually collecting season again haha. Went out at the start of the month but didnt take any photos. Which is actually a shame because there were some tomato clowns in their bubble tips and a few epaulette sharks. I'll be out there again soon so will try to remember to take photos if I see anything new. So it has been a while but I got out at the start of Nov again and tried to remember to take some photos. It was the lowest tide I have been out on and certainly saw some new things. There was heliofungia everywhere at the lower tide! There was some huge ones too. The size of dinner plates. There was also more slipper corals. It is a little hard to tell in this photo but this one was massive. I had been told there was purple goni out there but had never seen any until now. At the lower tide it was everywhere. Also saw lots of galaxea. 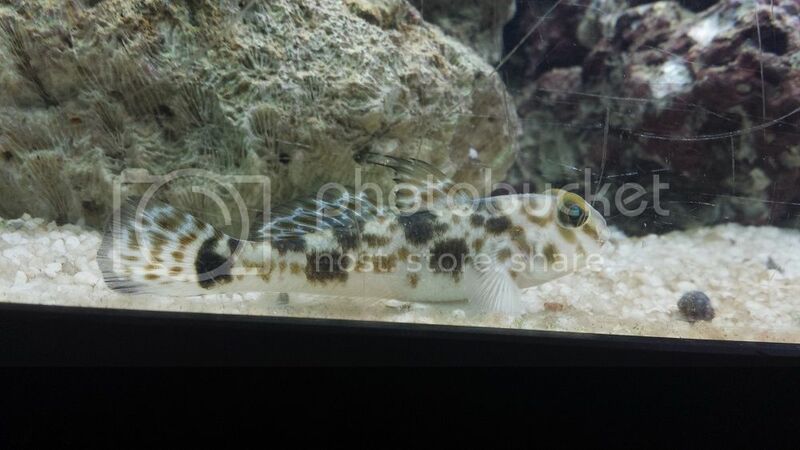 I am pretty sure this is a montipora. It was so huge. Saw one tomato clown fish but only got a terrible photo. I have no idea what this is. I think it is a sponge of some sort. We call these mud skippers here, I don't know if they would go well in an aquarium as they seem to spend most of their time out of the water (like it is in this photo). I'm not sure what kind of brain coral these are but they were everywhere this trip. And I was asked what the temps can get to out there so on a previous trip earlier this year I took a thermometer out and got some readings. It was quite a cool day as far as things go though so it can most certainly get hotter. This reading was from a semi large pool in direct sun, the pool had quite a few green favia in there but I couldn't get them in the photo because of glare on the thermometer. These pools were close to the bridge so they would have been in the shade an hour or two ago but were heating up. And this was a pool directly under the bridge which would be in the shade for most of the day.